Haven’t decided on a hotel yet? You can look at other available hotels in Madrid with Booking.com. 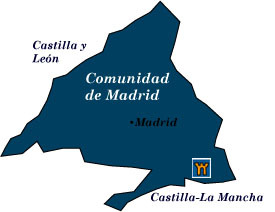 The Comunidad de Madrid came into being in 1983 as one of Spain’s autonomous communities. Formerly, it was part of New Castile, which is now called Castilla-La Mancha. The city of Madrid is its capital as well as the capital of Spain. As easy as it is to spend your entire time in the city, make the effort to spread out and discover the mountains to the north or the charming little towns to the south. One of the best things Spain has to offer is an afternoon in a rural restaurant, soaking up atmosphere and a bottle of wine. You can either use Madrid as a base and take day trips out, or break your time in half and stay outside the city for a few days (less expensive, too). The city of Madrid This vibrant world-class city has been Spain’s capital only since 1561. It is also the highest capital in Europe at 646 m (2100 feet). As befits any grand capital, Madrid hosts a long list of fabulous attractions, an unparalleled nightlife, tantalizing restaurants, and shopping galore. Museum Row: three of the world’s greatest art museums are in walking distance from each other: The Prado’s greatest strength lies with its collection of Spanish paintings, Goya and Velázquez leading the way. Italian art is represented by Raphael, Boticelli, Titian, and Tintoretto. There are over a 100 works by Rubens. Across the street is the Museo Thyssen-Bornemisza, which houses one of the most important art collections in the world. Once a private collection, you’ll find a remarkable collection of European art from the 13th to the 20th century, including (my favorite) Hotel Room by Edward Hopper. The Centro de Arte Reina Sofia emphasizes 20th- and 21st century Spanish art, featuring such famous artists as Joan Miró, Salvador Dalí, and Pablo Picasso, whose masterpiece Guernica is the showpiece. The Palacio Real, or Royal Palace, is one of Spain’s great architectural monuments. Half of the state apartments, filled with priceless art, are open to the public. You’ll find its location one of the most delightful areas of Madrid for a stroll. The 17th-century Plaza Mayor is one of Spain’s most magnificent squares and the center point of the city. Just south lies La Latina, an incredibly atmospheric and district of winding streets, small squares, and stately old palaces that give over to a dynamic nightlife of restaurants, tapas, and wine bars. Monasterio de las Descalzas Reales is not only a fantastic museum crammed with art but a working convent as well. El Escorial Felipe II constructed this austere, majestic, and enormous palace-monastery in just 21 years to commemorate a Spanish victory over the French in 1557, as well as to provide a burial place for his father, the Holy Roman Emperor, Carlos V. Architects Juan Bautista de Toledo and Juan de Herrara created a soaring basilica, royal palace, seminary, and library packed full of art treasures. Valle de los Caídos The “Valley of the Fallen” was dedicated by General Francisco Franco as a memorial to those who died in the Spanish Civil War. An enormous cross rises 150 m (490 ft) above a basilica, dominating the landscape for miles around. Manzanares el Real In the foothills of the Sierra de Guadarrama stands a magnificent 15th-century castle that was built more as a place than a defensive structure. Never completed, castle aficionados will love the elaborately decorated circular turrets and crenellation. Alcalá de Henares The fine Renaissance and Baroque architecture of Alcalá de Henares has led to a UNESCO World Heritage Site designation. In the late 15th century, a university was founded, becoming one of the most prestigious centers of learning in Europe. Alcalá de Henares is also the birthplace of Spain’s greatest literary figure, Miguel de Cervantes, and the ill-fated wife of England’s Henry VIII, Catherine of Aragon. Aranjuez You can easily spend a delightful day in this charming town, a UNESCO World Heritage Site, exploring the sumptuously decorated Palacio Real, the summer residence of Spain’s Bourbon rulers. A stroll through the regal gardens suggests in the inspiration for Joaquin Rodrigo’s famous guitar concerto, The Concierto de Aranjuez. Aranjuez is also known for its strawberries, which you can buy from roadside stalls. Chinchón This popular and picturesque little town offers an attractive Plaza Mayor, surrounded by three-story, 16th century houses that rise above porticoes. A passion play is held in the square on Easter and bullfights in summer. Chinchón is also home to a wonderful castle and palace hotel, the Parador de Chinchón.